It highlights one of the important myths of nativism: Mutually exclusive co-evolution. One reason nativists believe it is important to “restore” native plants is that they believe that wildlife depends on these specific plants. If this was actually true, then destroying those plants would endanger wildlife higher up in the food chain, and potentially collapse the ecosystem. Doug Tallamy popularized this theory to non-scientists. Do mutually exclusive relationships exist? Yes – but they’re rare. And they’re rare for a reason: They can’t handle change, and change is the norm for ecosystems. What’s much more normal in nature is adaptability – wildlife adapts to its environment, whether new food sources or new threats. The result of change is often more diversity, not less. The risk now is that a large number of people are invested in nativist theories – and practice, most of which involves chainsaws, pesticides, and digging up plants in a strange effort to garden the wilderness. 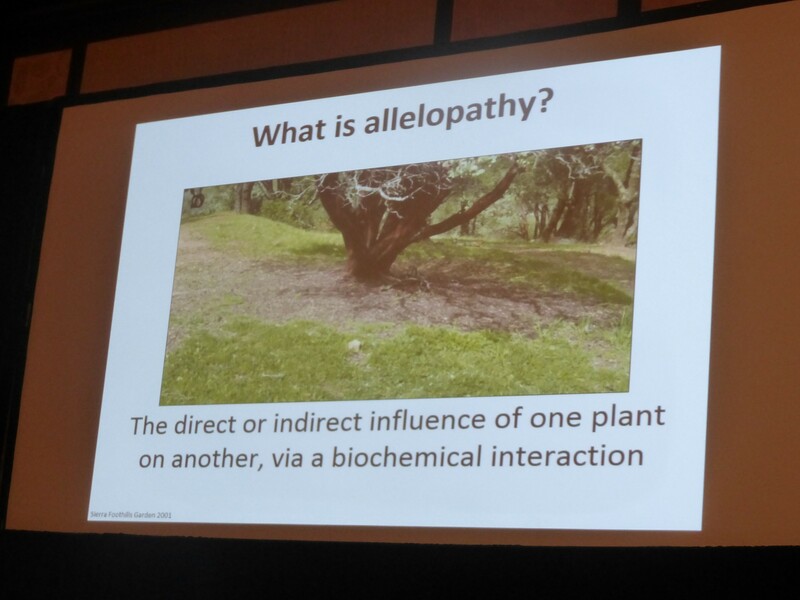 I am pleased to publish the following report of one of our readers who attended the conference of the California Native Plant Society in Los Angeles at the beginning of February 2018. The conference began on a low point for me, but a high point for most attendees of the conference. The keynote speaker was Doug Tallamy. He was introduced as a “rock star” of the native plant movement, and indeed he is. His presentation was very effective in delivering his message, which is that most insects are “specialists” with mutually exclusive relationships with native plants that evolved over “tens of thousands of years.” If you believe that claim, you also believe that the absence of native plants will result in the absence of insects and ultimately the collapse of the entire food web. Most native plant advocates believe that gloomy scenario, but few scientists still do, which creates a tension within this community of native plant advocates composed predominantly of amateur “botanists” and a smattering of academic ecologists. The high point of the conference for me was a presentation by Jennifer Yost, Assistant Professor at Cal Poly, San Luis Obispo. 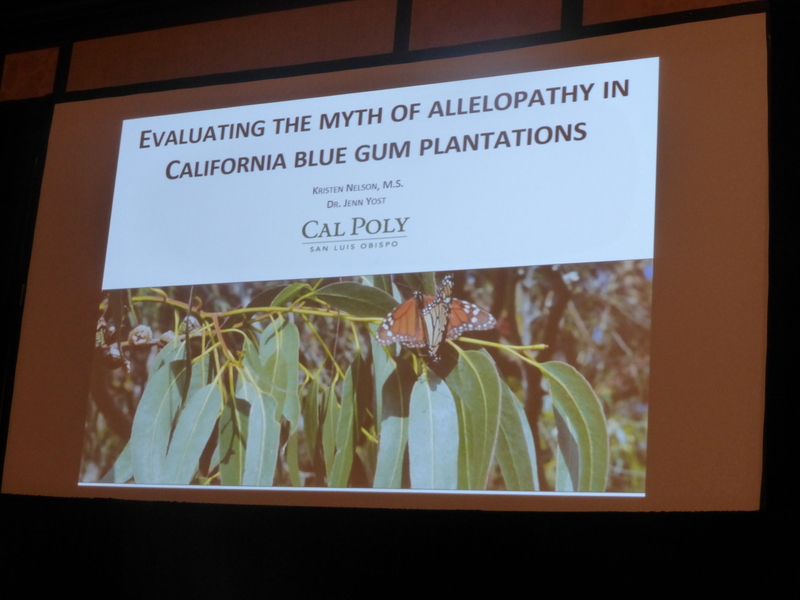 She and her graduate student studied the claim that nothing grows under blue gum eucalyptus trees because of allelopathic chemicals emitted by eucalyptus that suppress the germination of other species of plants. Two studies of this hypothesis were done in the 1960s, but the analytical methods used by those studies were misleading. Rigorous methods used by Yost’s team included planting seeds of 5 native plant species in the soil of eucalyptus forests and comparing germination rates of seeds planted in the soil of oak woodlands. They also tested the effect of blue gum volatile leaf extracts, and water-soluble leaf extracts on germination and early seedling growth. 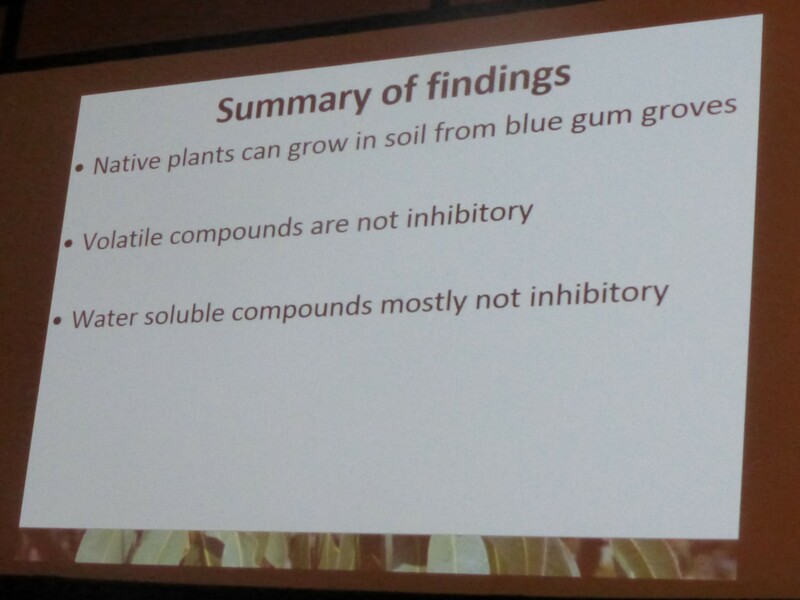 Yost observed that the lack of allelopathic effects of blue gum on the soil implies that blue gum forests theoretically can be successfully planted with native plants after removal of the trees. However, she cautioned that those who destroy the blue gums should carefully consider what will replace them. 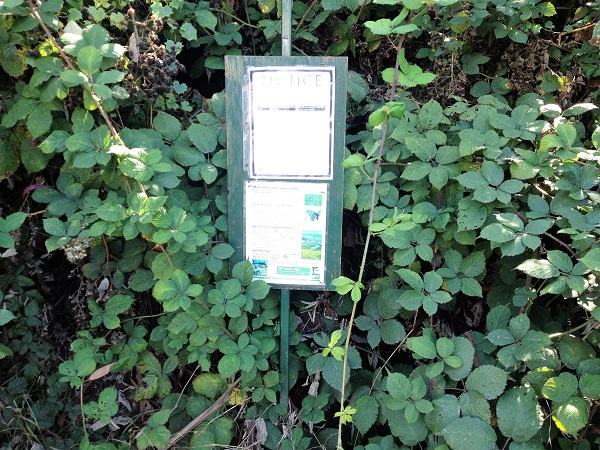 Will an aggressive non-native weed quickly colonize the bare ground? If so, what is the benefit of destroying the blue gums? I had a conversation with one of the most influential nativists in the San Francisco Bay Area after Yost’s presentation. This new scientific information does not alter his commitment to destroying blue gum eucalyptus in the Bay Area. After all, there are many more negative claims that remain unchallenged by scientific studies. For example, there are no studies that prove that blue gums use more water than native trees, as nativists claim. Nor are there any studies that prove that eucalyptus leaves contain less moisture than the leaves of native oak or bay laurel trees, which theoretically makes eucalyptus more flammable, as nativists claim. The lack of scientific evidence enables the persistence of speculation justifying irrational fear of blue gum eucalyptus. 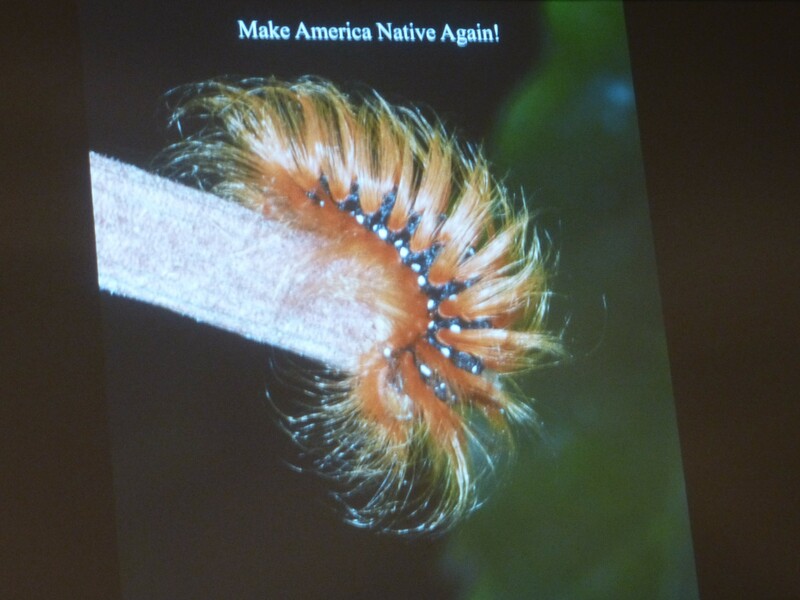 The tension between science and the citizenry is as evident within the native plant movement as it is in American politics at the present time. The general public rejects scientific evidence at its peril. The rejection of science will not end well. In the case of uninformed nativism in the natural world, the result will be a barren, poisoned landscape. This entry was posted in eucalyptus, nativism and tagged CNPS, environment, eucalyptus, nativism. Bookmark the permalink.